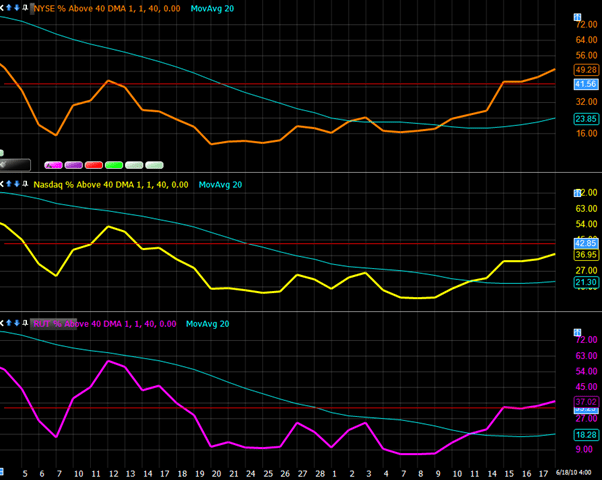 I am sharing my 40 DPI StockFinder chart and code on Worden’s share system. This is an excellent breadth chart for longer term swing trading. Basically stay long if the index is above its 20 day moving average and short on the other side. There are three indexes tracked. The top is the NYSE, middle NASDAQ and the lower chart is the Russell 2000. Login to your StockFinder 5.0 (this only works on stockfinder 5.0 and above). Goto the “Share” tool bar and click. Choose the “Charts Tab” and find my name and the Chart. The chart is password protected. To activate the chart you need the password. Only registered members of the this site can see the password, which is the next line below in this post. If you have not registered please do so.. it is free..
note there are three “t’”s in there. Enjoy!.. you should be able to save the chart now on your system.